A significant amount of my reading time is spent in children’s literature. With nine children in the house and all of them eager for a steady stream of books, it can keep me quite busy. However, this summer I took a moment to take a peek at the new adult fiction shelf. A Master Plan for Rescue (Janis Cooke Newman) caught my eye and found its way into my book bag. It’s 1942 and we travel to New York and meet a young boy. His simple life with two loving parents begins unraveling with the unexpected death of his father and his mother’s overwhelming grief. In Berlin, a young man falls in love with a beautiful woman who is dying. His time with her is a long goodbye. The lives of the young boy and the young man meet and find that their grief draws them together in a unique way. Both want to make a difference in the world for those that they have lost. Deep in their hearts, they both believe that in helping someone else, they will somehow bring those they have lost close to them again. Set during World War II, A Master Plan for Rescue definitely weaves in historical aspects of this time period. However, the strong pull of this book is in the relationships. Beautiful, deep, bittersweet relationships. My heart broke for Jack when he lost his father. A boy who loved his father so deeply can not bring himself to accept that his father is gone. He imagines how his father escaped the accident. Jack decides that he will help find Nazis and then his father will come back home. His heart refuses to let his dad go. Jakob, a Jewish young man, has fallen in love with a beautiful woman. And she is dying. Jakob knows that as a Jew he needs to leave Berlin. However, his beloved will not go as she is dying. Jakob continually fights for her to come with him. Ultimately she forces him to leave without her before it is too late. Jakob’s and Jack’s lives meet and have before them a heroic deed…..the love for those they have lost drive them to do the impossible. 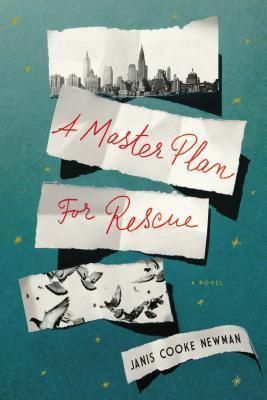 A Master Plan for Rescue has been one of the best adult fiction books I have read in some time. The stories of Jack and Jakob were gripping and I was compelled to finish the book as quickly as possible. Janis Cook Newman wove together such a beautiful story. I think she captured the thoughts and heart of a young boy like Jack so well. While grief is one of the forces pushing the characters forward, there is more to the book than just sadness. There is joy and laughter. Friendships. Love. Beauty. We can easily view history as a broad brush stroke across a canvas. A Master Plan for Rescue shows us that history is not this broad stroke of a brush. History is a young boy and a young man driven by love to become heroes. This entry was posted in Book Reviews, Books and tagged Books, history, reading by sweetie. Bookmark the permalink. I enjoyed reading through some of your reviews and other posts. Your blog is lovely, and your writing voice is simple and sincere — a pleasure to read. I hope you continue posting, even though I know finding time to write can be difficult with family life, especially with a wonderful family life. Thanks for the review. |I don’t think I would have picked this one up from just observing the cover but now I’ll keep a lookout at the library. Would love to hear you thoughts if you get the opportunity to read it! Thanks for stopping by.